Boldstar performed a two-stage pressurized infrared survey on this building as part of a building envelope study. 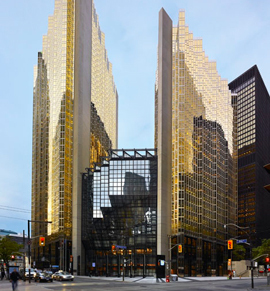 Our service was able to locate areas of air leakage and thermal conduction. .
Our inspection services were used to perform an exterior wall air leakage study on this downtown Toronto financial highrise. Our two-stage pressure IR survey service can identify both air leakage and thermal conduction issues.